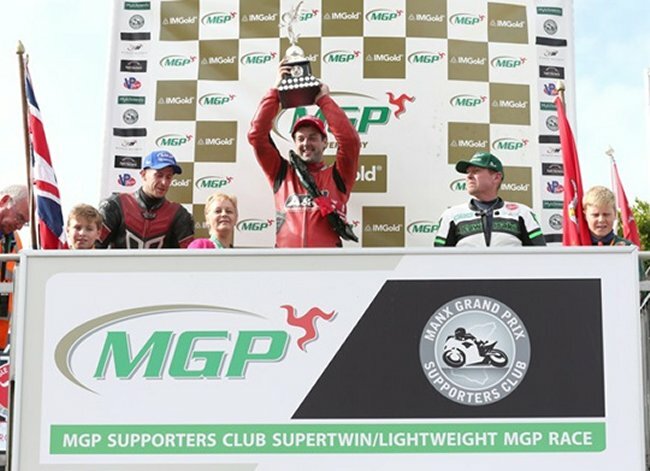 Wigan rider Jamie Hodson emulated his brother Rob by winning the 2016 Manx Grand Prix Supporters Club SuperTwin Race at the IMGold Manx Grand Prix. With Andrew Farrell injured in the MGP Junior Race following his accident at Glen Helen earlier in the day, 1983 Senior MGP and ’93 Formula 1 TT Race winner Nick Jefferies, who finished third in the corresponding race last year, was first away on the Phil Morris Holdings ER6 Kawasaki followed by Junior race winner Andrew Dudgeon, the fastest qualifier, and Skerries’s Dave Lumsden on the Full Factory Winnerswear Kawasaki. Andrew Dudgeon (3) followed closely by Jamie Hodson (5) who leads on corrected time. Jefferies was first on the road to Glen Helen and established a 1.4 lead over Dudgeon who was riding the CBG Contractors Rob Brew Racing Suzuki. However, Hodgson (CMS/SB Tuning Kawasaki) was the race leader on the clock, building a lead of almost three seconds from Darren Cooper (Flue-Stox Kawasaki) with Richard Charlton (Michelin Kawasaki) in third. Lumsden was less than a half a second back in fourth with Spain’s Victor Lopez Santos, who was a newcomer in 2015 on the Team Martimotos Kawasaki completing the top five. Jonathan Perry Kevin Little Motorsport KLM Kawasaki), fresh from the excitement of his newcomer B runner up place in Tuesday’s Race, was running well in sixth. Dave Lumsden moved up into second, four seconds behind Hodson and just 0.1 second ahead of Cooper at Ballaugh and that remained the order at the Bungalow with Hodson stretching the lead over the second placed man to almost 8 seconds with the gap between Cooper and Lumsden only 0.2. That remained the top three on the opening lap with Hodson’s 112.331 / 20:09.174 giving him a lead of almost 12 seconds from Lumsden (111.424/ 20:19.021) with Cooper (111.274/ 20:20.660) third with the gap to the second placed man extended to 1.6 seconds. Richard Charlton (110.897/ 20:24.807) and Andrew Dudgeon (110.439/ 20:27.036) completed the top five with Perry (110.439/ 20:29.887) maintaining sixth place. Perry was on a charge on the second lap and moved into fourth at Glen Helen and was up to third by Ramsey, almost four seconds behind Lumsden and less than half a second ahead of Cooper. Hodson’s second lap of 112.969 gave him a lead of over thirteen seconds from Lumsden with Lumsden, posting the fastest lap of the race 113.423. However Perry had another problematic pit at the end of the second lap, as he had in Monday’s Newcomer B race, which cost him that race. This time he lost over thirty seconds to his nearest rivals dropping from third to 6th at Glen Helen on the third lap, now 28 seconds off the final podium place while Dudgeon moved narrowly ahead of third placed man Lumsden by less than a second. Lumsden and Dudgeon continued their battle over the Mountain section with Lumsden moving in front of the Ramsey rider by almost 2 seconds by the Bungalow but out at the front Hodson’s lead was still a commanding 10.4 seconds, although he’d lost a couple of seconds on the Mountain. Hodson’s third lap of 108.262 (20:54.620) gave him an eleven second lead from Lumsden with Dudgeon continuing his challenge less than a second further back in third with Cooper (107.606) and Perry (106.099) completing the top five. Hodson duly held on to take the chequered flag in 111.594/ 1:21.08.664 with Lumsden holding off the challenge from Dudgeon to take second place in 111.212/ 1:21.25.388, just over three seconds ahead of Dudgeon (111.136/ 1:21.28.705). 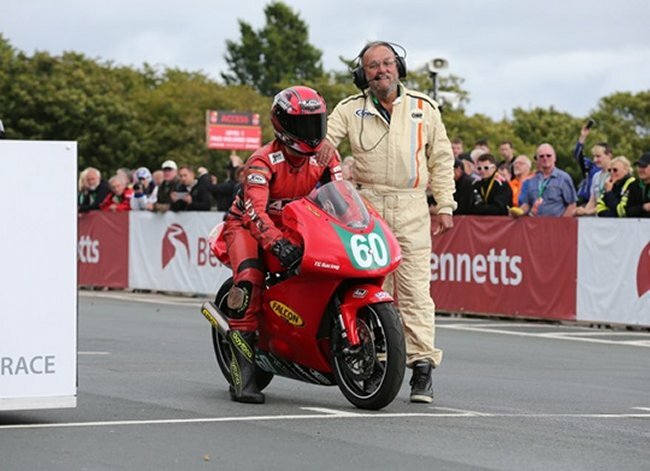 In the concurrent Lightweight race, 8 time TT sidecar passenger race winner Dan Sayle, the fastest qualifier, dominated from gun to tape to win in a new race record of 1:23.45.501/ 108.111, his third Manx Grand Prix win. Sayle reached the Glen Helen timing point first on the road and on the clock, establishing a lead of 1.5 seconds over Dave Taylor with Rikki McGovern on the Honda RVF 400 in third. Sayle’s opening lap of 107.663/ 21:01.599 gave him a fifteen second lead from Rikki McGovern (106.439/21:16.116) with Dave Taylor (106.092/ 21:20.287 holding third place. 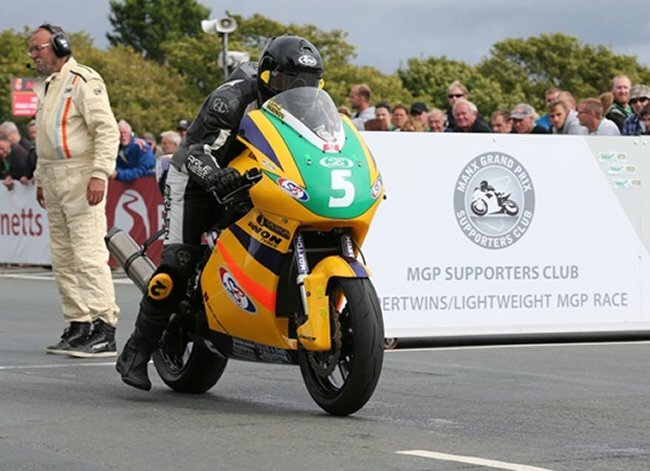 Dan Sayle about to get the famous tap on the shoulder to start the Lightweight MGP. Sayle continued to dominate the race and extended his lead to over thirty seconds with a second lap of 109.228. With his nearest rivals McGovern and Taylor both coming in to the pits at the end of the second lap, Sayle’s lead was almost 1 minute and 45 seconds by Glen Helen on the third lap which he extended to almost 2 minutes from McGovern with a third lap of 108.737. Dan elected not to pit, running through at the end of the third lap, and posted a last lap 106.847 to win by a minute and 46 seconds from McGovern (105.878/ 1:25.31.511). However there was drama for the last podium place in the Lightweight class. 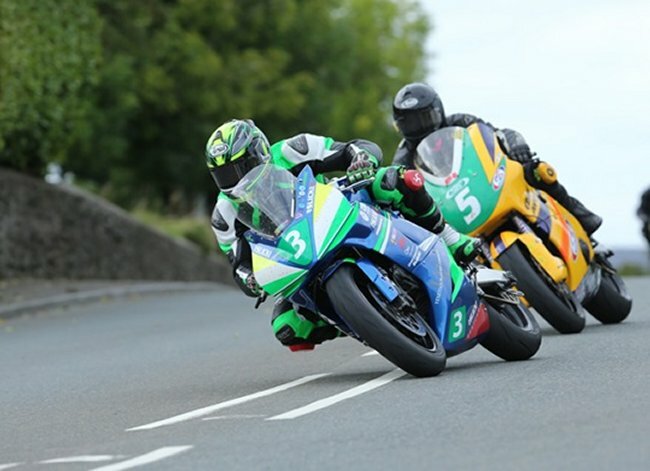 Third placed man Dave Taylor was reported to be pushing in from Governors and Lancelot Unissart in fourth retired at the Bungalow which meant that Elwyn Frier (103.942/ 1;27.07.049) was called back from the race paddock to the winners enclosure to complete the podium.